A two-block 22 storey residential building topped out last month on the site of an old subterranean car park in Birmingham. Joe Bradbury was in attendance at the event, which proved to be a milestone for Creagh Concrete and a testament to the true power of offsite manufacture. Standing on top of a 22 storey building in the middle of a city I hold dear was something I am unlikely to forget. As Editor of Building Specifier and regular contributor to trade publications within the construction industry, offsite construction is something I get to write about on a regular basis. But to actually stand on top of a tower block that was built using such practices brought with it a profound sense of what we are capable of as an industry when we set ourselves ambitious targets and knuckle down to achieve them. The two blocks house 323 apartments and have been built in a major contract by housing giant Galliford Try. The £40m project is part of a build-to-rent scheme for client Dandara Living, one that is expected to significantly boost the number of homes available in close proximity to Birmingham’s city centre once completed. Comprising two blocks of 17 and 22 storeys linked by bridges at each level, the development will feature studio, one-bed and two-bed apartments with balconies across all elevations. The towers are the tallest structure completed by Creagh across their entire 43-year history; and as a proud Midlander and lover of Brum, I would pose the question: where better for such a feat to proudly stand than beside the existing Alpha Tower, a Grade II-listed office built in the 1970s, considered one of Birmingham’s most well-known architectural landmarks? The decision to use precast concrete systems for the bulk of the building’s structural frame, cladding and balcony units was taken at an early stage on the project. The brief demanded a robust finish on the building, which would limit the amount of ongoing maintenance required. Precast concrete is the ideal material of choice for frame construction and cladding. With this in mind, the project team looked at various different options for the structure and its subcontractors, before settling on the team at Creagh Concrete to deliver and install the frame panels, cladding sections, balconies and floor slab. The placing of each level is based on a turnaround time of just 10 days. Prefabricated bathroom pods, manufactured in Hull, are lifted directly into position at each level as part of the cycle time therefore it was important that these were delivered between days five to seven – any later runs the risk of disrupting the project programme. 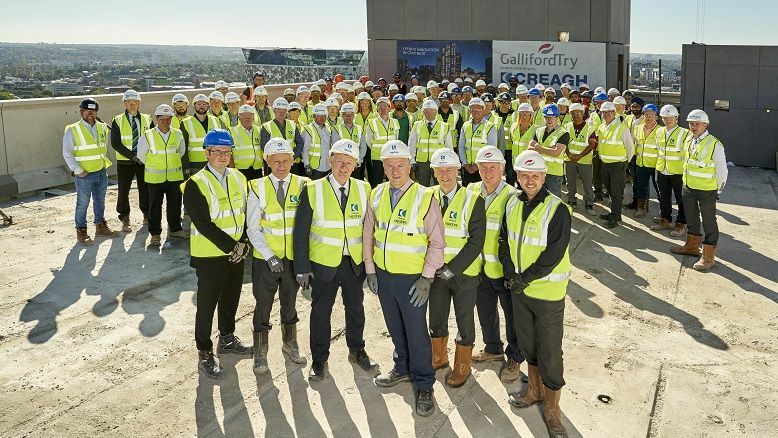 With a turnaround time of just 10 days to place each level, the Galliford Try team is running the internal following trades just three floors behind. Creagh Director and Co-Founder Seamus McKeague concluded “We are seeing strong interest in our rapid build concrete systems because developers now understand the true value of slashing programme times.